As the days get shorter and the weather much chillier, I’m not only reminded of how quickly fall semester is passing, but also of the many great humanities and digital humanities events I’ve had the chance to attend over the past few months here at Penn. 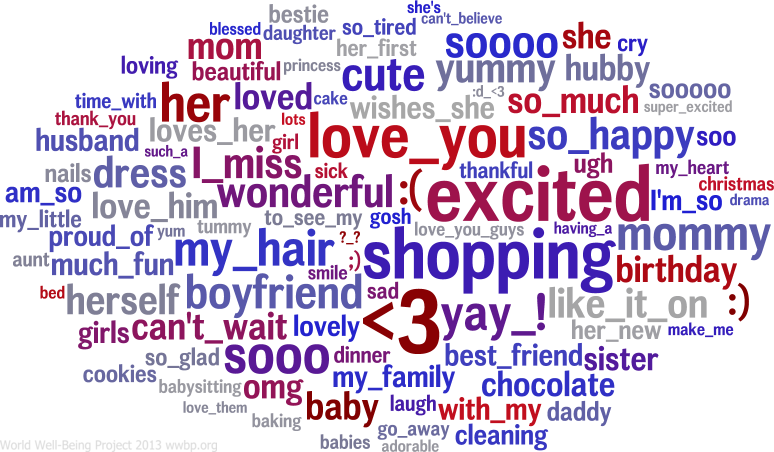 A typical “female” word cloud. Image courtesy of the World Well-Being Project. A couple of us from WIC recently attended a Digital Humanities Forum event called “Measuring Well-Being Using Social Media,” showcasing a joint project between the Department of Computer and Information Science and the Penn Positive Psychology Center. As part of the World Well-Being Project at Penn, researchers Lyle Ungar and Andy Schwartz are using “differential language analysis” on massive amounts of data from social media sources, such as Facebook and Twitter, in order to gauge peoples’ emotions at the time they post a status update or Tweet. The project used a Facebook app called myPersonality to track users’ status updates. The researchers then created data clouds that show word frequencies and gender correlations with word usage.